Events are often at the core of an organization’s fundraising and constituent engagement strategies. Because events are so crucial, it’s vital that you find event management software that can truly be your nonprofit’s partner in the event planning process. Without software to streamline and enhance your event management experience, you could be left with loose strings, a confused team, and worst of all—an empty venue come event day! Determine which event management features you need. Plan your search around your budget. Look for software that works with your CRM. Anticipate the types of events you’ll plan (and how many). Know how much training and support your vendor provides. Event management is no small task, but with strategic planning and the help of strong software on your side, you’ll be an event planning pro in no time. 1. Determine which event management features you need. Before you start shopping for new software, it’s important to determine exactly what you’re looking for in your event management solution. Having access to any and every event management tool might seem like a good thing. 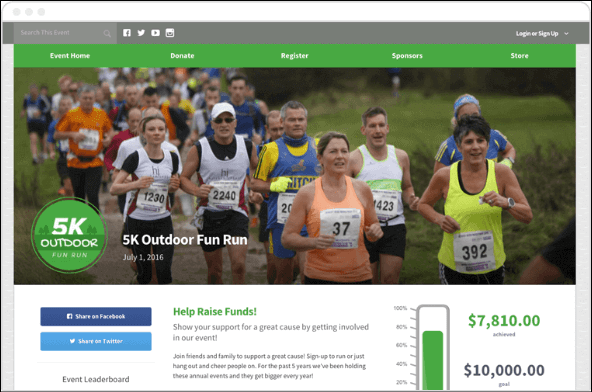 In reality, not every nonprofit needs to purchase a complex, expensive solution; for many organizations, a fundraising platform with lightweight event management features can work wonders! With Qgiv, nonprofits can manage events as part of a peer-to-peer campaign. If you don’t determine what you need before confirming your purchase, you might end up spending money on features that aren’t relevant to your organization’s needs or, alternatively, selecting a product with too few features to actually get the job done. Designing branded event registration forms to collect specific donor data. Setting custom ticket prices or registration levels. Managing logistics, e.g., venue, vendors, auction items, exhibitors, and speakers. Promoting your event through communications, social media, or an event website. Staying on top of invitations, guest lists, RSVPs, and wait lists. Analyzing event success through pre-built or custom reporting. Accepting additional donations on-site or online (including merchandise sales). Event management encompasses a wide variety of activities and responsibilities, but it’s up to you how comprehensive or lightweight you want your software to be. To sum up: Before you can decide on an event management tool, you need to determine what features your organization needs to succeed. Bonus: Planning an event in Salesforce? Before hitting the AppExchange, know how to sharpen your focus to apps that will meet your needs. For help, check out Fonteva’s list of the 5 must-have event management features. 2. Plan your search around your budget. As with any nonprofit software, event management software can be a major investment for your organization, especially if events are central to your fundraising strategy. Upgrade fees (to allow for more users, events, or constituents). Training costs, either through your vendor or an outside consultant. Cost of integrations with other products. You’ll likely be taking your pitch for new software to your board before signing off on the purchase, so be sure that you can develop a case for why this product is worth the price tag. If you think the product you need is out of your price range, don’t stress yet—there are plenty of low-cost or even free event management tools that you can get started with. Once you can see the impact of these tools in real time, you’ll have a better perspective on if the software is a smart investment long-term. To sum up: When budgeting for event management software, don’t forget to account for upgrades, training, and payment processing in addition to the initial cost. 3. Look for software that works with your CRM. More than likely, your organization is using some kind of CRM or nonprofit database to keep track of donor records and other important data. As you’re searching for software, be conscious that not all platforms work together seamlessly (and some don’t work well together at all!). If you don’t want to be left with disconnected, incomplete, or lost data, find an event management solution that can integrate with your existing CRM. Your nonprofit will be collecting a lot of donor information as you accept registrations, so make sure you have a plan to store all your new data. Integrate a third-party platform with your CRM, which usually requires a data transfer process with the help of your vendor or a specialized consultant. In this case, there’s no guarantee the two systems will be compatible. Search for an event management app that’s built for your CRM. If you’re using a larger CRM (such as Salesforce), you’ll have access to tools designed specifically to fit within your database. To ensure compatibility, search for a native application that was built using your CRM’s infrastructure. Purchase a CRM with built-in event management tools. If you’re only in need of lightweight event management tools, you should have no problem finding a CRM with built-in event features. Everything will be accessible in one system, but you may eventually find yourself in need of more comprehensive tools. No matter which path you choose, be sure you’re fully aware of the data transfer or integration process before you select a platform. Integration can be time-consuming and complicated, so ask your event management software vendor about what the process entails early in the buying process. Having all your donor information stored in a central location like your CRM is key if you want to gain a full picture of your donors and the success of your event. This is especially true if you’re using event management tools to track your registration and other fundraising methods, promote your fundraiser, and manage your event detials; it’s important that all these services work together. To sum up: Your nonprofit shouldn’t have to deal with the headache of using event management software that doesn’t work with your CRM. Opt for a software solution that makes tracking data simple. Bonus: Looking for top-notch event fundraising software? Many nonprofits might be familiar with Eventrbite, a popular event management and marketing tool. But there are so many other options that might be better suited for your organization. Check out this list of Eventbrite competitors, rated and reviewed just for you! 4. Anticipate the types of events you’ll plan (and how many). Different types of events require different event planning strategies. While that concept might seem like a no-brainer, it’s one that can seriously trip your nonprofit up if you don’t keep it in mind during the software buying process. Think of it this way: a charity auction held in a ritzy ballroom might raise around the same amount as a community-wide peer-to-peer walkathon, but the steps your team will take to get there? They couldn’t be more different! To ensure that your event management software has all the tools that your event needs, spend some time brainstorming what types of events you’d like to plan in the coming year (as well as down the line). For some, that simply means refreshing your take on a classic annual event. For others, deciding which events you’ll want to plan in the future might mean strategically reviewing past events, both those that have gone well and those that were less than profitable. Single-day events, such as a gala or major donor dinner. Multi-day or multi-track events, such as conferences or staff retreats. 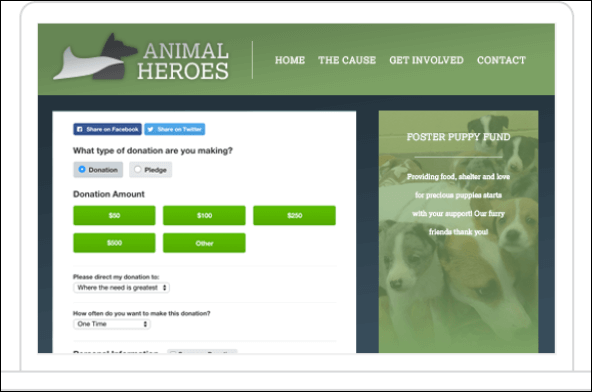 Peer-to-peer fundraising events, with individual campaign pages for fundraisers. Training courses with recurring sessions. Live, silent, or online auction events with items to keep track of. Not only should you consider what types of events you’ll be planning; you should anticipate how many events you’ll host, too. Many event management platforms are priced based on the number of events you’re able to host. If you only plan one or two events per year, you might not need to spend money on comprehensive software. On the other hand, if regular events are the lifeblood of your organization, it makes more sense to spring for the unlimited option. To sum up: Not only do you need to think about the features your organization wants, but you also need to consider the specifics of your events. Look for a tool that has the capabilities to plan the types of events your organization regularly hosts. Bonus: If you’re planning on raising funds through peer-to-peer events, you should have no problem finding a platform that can help you with event logistics and enable your supporters to raise funds and awareness for your cause. To start your search, consider these top peer-to-peer software providers! 5. Know how much training and support your vendor provides. To get the most out of your event management software, your fundraising team has to know how to use it! You should get an idea of how your new product works by talking with your vendor and seeing a demo before purchase, but to make sure you have a thorough understanding of the software’s ins and outs, ask your vendor what training options they have available. Online resources, such as product guides or how-to articles and FAQs. Personalized training over the phone or via webcast. In-person training with a member of your software’s team. For some platforms, initial training is included in your base price. Other software providers may offer training at an additional fee, and others may not offer training at all! If your vendor doesn’t offer training, you can always look for outside help in the form of a fundraising consultant. Many consulting firms have staff that are specially trained in specific software and can work with your team to make sure everyone is on the same page with the product. To sum up: Before finalizing your decision, look at your top choices to see if they provide training. Whether it’s for free or an additional cost, having a crash course on how to use your new software will help make the transition easier for your staff. Bonus: Does a software consultant sound like something your organization could use? Check out Aly Sterling Philanthropy’s team of consultants to give your nonprofit the edge it needs to succeed in fundraising! Planning events can be a difficult task, but finding an event management software doesn’t have to be! Peer-to-Peer Fundraising Guide. Peer-to-peer fundraisers pair exceptionally well with events. Learn why peer-to-peer is one of the most popular (and powerful) fundraising tactics around. 7 Steps to Planning Successful Salesforce Events. If you’re using your Salesforce CRM to put together stellar events of all sizes, Fonteva’s got you covered. This article will teach you all the necessary steps to hosting an event with Salesforce. Double the Donation’s List of Top Cvent Competitors. Think Cvent is your only option for planning top-notch events? Think again! Double the Donation has the breakdown of all the names in event management you need to know.